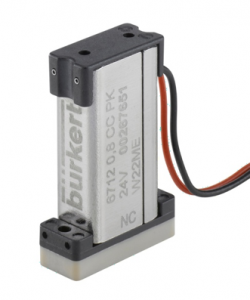 Twenty five years ago, Bürkert launched the pioneering rocker solenoid valve. The design has evolved over the years, spawning the compact TwinPower and silent WhisperValve. What will the next quarter of a century bring? Tony Brennan, Field Segment Manager for .gas and .micro, spoke to PIF about the evolution of rocker valves and gave us a glimpse into the future. “We introduced the rocker valve in 1993 and at the time there weren’t any other valves like it on the Market,” says Tony Brennan. “There are now of course because the design has been copied. At the time though it was unique. The rocker valve allows you to operate at higher back pressures than a conventional plunger valve does and, with a 3-way circuit function, it is perfect for use on syringe pumps for dosing applications. With a media separated plunger valve, although you have a large orifice, you’re restricted by the amount of back pressure the valve can withstand and stay closed against. “The beauty of the rocker valve is the actuation principal. Instead of having a plunger which moves up and down a guide tube, you have a rocker that switches across a pivot point on the media separated diaphragm. As the moving mass of the rocker is very low, there is minimal wear when the valve is switched. This ensures a long service life, making it an ideal choice for high cycling equipment where operational reliability is important,” he adds. “Our Burkert TwinPower technology operates with two coils instead of only one as before, packing more power into less space,” Tony continues. “With the double solenoid TwinPower technology the Type 6624 and Type 6626 give you 3-5 times more flow than any comparable valve on the market. Plus, if you’re looking for space savings, Burkert TwinPower valves take up to 50% less installation space whilst offering the same fluid switching capacity as was only originally possible with a micro valve twice as large. “The Burkert Type 6724 WhisperValve makes nearly silent switching possible and is the fastest media separated rocker valve on the market. With a KV flow rate of 0.026m3/h and a pressure range from vacuum to 3 bar, it is ideally suited to dosing applications via syringe pumps and the pipetting of samples through dosing needles. The valve’s fast switching speed, low internal volume and electro- dynamic rocker actuator make low volume dosing accurate and reliable. “WhisperValve has all the good things that we’ve developed into the rocker valve but in a smaller space envelope, which is predominantly quieter than conventional valves in the range. For point of care devices, which might be operated at the patient’s bed, the WhisperValve is ideal because it makes no noise and you can’t really hear it switching,” Tony adds. Watch this video about the TwinPower Type 6624 valve. Could low power valves be the next evolutionary step? “Generally, in the marketplace, people are looking for lower power consumption from their valves,” says Tony. “The rise in point of care medical devices means that there will be a rise in battery powered instruments. Obviously, if you have an instrument that uses valves that take very little power, then the instrument will last longer before having to be recharged. “For those sorts of applications, the biggest obstruction is the battery technology in them. You can only use them for 9-10 hours and then you have to recharge or change the battery. In the future, I can see there will be more valves on the market which have been optimised to use less power. “Perhaps latching coils will become more prevalent, where the valve is pulsed open or closed and only uses power for a short period of time whilst the valves moves position, with no holding power consumption. This may well help to extend the operational life of point of care equipment,” Tony concludes. One thing is for sure; whatever the technology that drives the next valve innovation over the next quarter of a century, you can guarantee Bürkert will be at the forefront of its development. For more information visit Bürkert.